$24.131 million on 2824 screens. When I view a typical summer blockbuster shoot-em-up movie, I usually find it easy to deactivate the logical parts of my brain and simply go along for the ride. Why did the space-buggies in Armageddon have machine guns on them? Because it looked cool - next! Unfortunately, the workings of Con Air stretched credibility way too far. The film wants to have its cake and blow it up, too: it needs a protagonist who is a convict but not a criminal, someone with whom the audience will sympathize and respect. 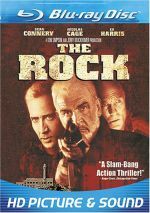 To accomplish this difficult feat, Cameron Poe (Nicolas Cage) goes to jail after killing a man in a bar fight. Sounds simple, right? No, because this was no ordinary bar fight: Poe and his wife Tricia (Monica Potter) get attacked by three drunks - rednecks, of course, since the audience already hates them - and Poe accidentally kills one of them. Note that the scumbag came at Poe with a knife when this occurred, and Poe did all this to protect his pregnant wife. If you haven't seen the film, you're probably wondering how someone could get sent to jail for a clear case of self-defense. Poe was just discharged from the military, where he served as an Army Ranger. According to the judge, Poe - and all other Rangers, I guess - aren't subject to the same laws as the rest of us because they can fight too well! Poe is sent up the creek for what appears to be the maximum sentence, even though he copped a plea to get a shorter term. That’s some nice lawyering! Sorry, but I just could not get past this patently absurd premise. When I watch Apocalypse Now, I prefer to stop it about two-thirds of the way through because the last 50 minutes of it - the Brando scenes - are so bad, they nearly ruin the film for me. That’s the impact the opening of Con Air has on me: it’s so idiotic that it nearly harpoons the rest of the flick. Seriously, what did the judge think Poe should’ve done? Should he have simply let the drunks beat the crap out of him? Apparently he’s not allowed to fight back, so what’s the alternative? Lay down and take the physical abuse? Surely the screenwriters could’ve invented a more believable way to send Poe to jail but still have the audience like him. Once you get past the ludicrous set-up, Con Air seems mildly entertaining. It's a by-the-numbers Jerry Bruckheimer production: good cast, nice production values, stuff blows up, vaguely fascist overtones, blah blah blah. Bruckheimer often does his thing well, but his films clearly have a sameness to them that can be enervating. Of the Bruckheimer films from the period around this one’s 1997 release - Enemy of the State, Armageddon, The Rock, Crimson Tide - I found Con Air to stand as the weakest of the bunch. Basically, it suffers from the slightest storyline of the pack. All of those other films showed heroes battling for some greater societal good, whether to save the world (Armageddon) or just to save some tourists and a city (The Rock). Con Air lacks that sense of real heroism. Sure, you could argue that when Poe takes it upon himself to stop the planeload of convicts from escape, he keeps them off the streets and protects innocent people. However, I never really get the sense that this motivates him. Mainly, he wants to halt the progress of his fellow prisoners because the script tells him to do so. The flick adds his quest to save his diabetic insulin-needing buddy “Baby-O” (Mykelti Williamson), but that’s a loose connection/motivation. All plot faults aside, Con Air does deliver the basic goods. It moves along at a decent pace and provides a fair amount of thrills. Again, it doesn't offer a memorable action flick, but it nonetheless gives you a fairly watchable and entertaining two hours. Con Air appears in an aspect ratio of approximately 2.35:1 on this Blu-ray Disc. A fairly early Blu-ray, this one showed its age. The most obvious issues stemmed from a generally “digital” feel. Moderate edge haloes became obvious through much of the film, and obvious digital noise reduction marred the proceedings; that technique erased fine detail and gave characters clay-like, flat complexions. Sharpness was usually decent, though the haloes and DNR meant definition lacked real clarity; the movie never became especially soft, but it seemed mushier than it should and didn’t display good delineation. Jagged edges and shimmering remained absent, at least. As for print flaws, I noticed an occasional speck or mark, but these weren’t a substantial issue. The majority of the film looked clean. Like everything else, colors tended to be dull and bland. They could’ve been worse, but except for a few exceptions – such as the Las Vegas shots – the hues veered toward a lackluster, lifeless feel. Blacks were inky, while shadows tended to be dull, as low-light shots suffered from the same hazy murkiness that affected the rest of the image. The studio needs to redo this Blu-ray, as the film could – and should – look much better than this smeared, digital mess. On the other hand, the Uncompressed PCM 5.1 soundtrack of Con Air worked well. The soundfield provided an involving experience that remained active throughout the entire film. All five channels received a serious workout on a frequent basis, as the different speakers rarely received any down time. None of this use seemed to be forced or artificial; the elements blended together naturally and believably for a distinct, engrossing experience that helped make the movie more enjoyable. Audio quality also sounded good. Dialogue displayed nice warmth and only suffered from a smidgen of edginess at times; the lines were always intelligible and usually natural. Music sounded clear and vivid, as the score showed good dynamics and fidelity. Effects were also dynamic and accurate, without only a bit of distortion on a dew occasions. In the end, the soundtrack worked well for the movie. How did the Blu-ray compare to the 2006 DVD? The lossless audio demonstrated a bit better breadth and range, while visuals were a little tighter and more dynamic. That said, the image suffered from too many flaws to be a notable improvement over the DVD. Objectively, it looked better, but given how much better it should look, I find its avoidable problems to be more of a distraction. I can forgive flaws on DVDs easier than I can on BDs, so this disc’s issues made it a tough viewing for me. Note that the 2006 DVD included only an extended cut of the film, whereas the Blu-ray gives us the theatrical version. It offers no choice between the two, so fans of the longer edition won’t find it here. Though billed as “Original DVD Features”, most of the components found here didn’t appear on either the 2006 or the 1998 DVDs. We do get a trailer found previously but the BD’s two featurettes didn’t pop up on the earlier discs. We locate A View from Above (4:39) and The Destruction of Las Vegas (2:41). Across these, we hear from producer Jerry Bruckheimer, director Simon West, visual effects supervisor David Goldberg and actors Nicolas Cage, John Malkovich, and John Cusack. The shorts discuss character/story areas, stunts and effects, cast and performances. These are basic promotional pieces without much merit; they include a few good shots from the production but lack depth. Under Movie Showcase, we’re told we’ll get “instant access to the filmmaker’s most cinematic moments that showcase the ultimate in high definition picture and sound”. What this means is that we find an alternate form of chapter search, as the “Showcase” links to three short clips; these run a total of two minutes, 33seconds. The “Showcase” feels pointless to me. The disc opens with ads for WALL-E and Gone Baby Gone. 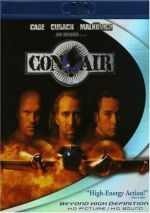 As a movie, Con Air provides a moderate amount of fun thrills, but it feels more like a “cookie-cutter” release than it should. While it gives us some good moments, it’s too inconsistent. The Blu-ray delivers solid audio but suffers from flawed visuals and insubstantial bonus materials. Con Air needs a new transfer, so this one’s not worth your time.